Whether you want to break into information security, move from one job to another, or transition into management, Breaking into Information Security will help. No other book surveys all the different jobs available in the industry, frankly discusses the positives and negatives of each, and what you need to learn to get into and out of each role. Unlike books that focus on a specific skill set or on how to gain a certification or get a job, this book encompasses the "big picture," including why certifications, if any, are worthwhile for you. 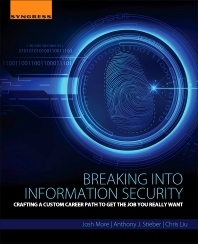 In a profession where new career paths aren’t always clear, Breaking into Information Security will teach you how to identify where you are in your career today, understand where you wish to go, and provide proven methods to get there. From entry-level jobs to the extremely specific skills needed to be an InfoSec consultant, this book covers it all, including in-job skill building, working within the community, and building your skills after hours. If you are seeking to advance in the highly competitive field of information security, this book will give you the edge you need to break in. Junior-level Information Security practitioners, consultants, and IT professionals looking to make the switch into the InfoSec field. An academic audience among information security, computer science, and other IT majors. Anthony J. Stieber has over 18 years of experience in the information technology industry working in academia, banks, retail, and insurance; designing enterprise security architectures, installing military and commercial firewalls; engineering medical diagnostic systems; reverse-engineering Internet stores; encrypting Fortune 100 enterprises; providing expertise for court cases; speaking at information security conferences; becoming an apprentice locksmith and a published writer. Chris Liu has over 15 years of information technology experience, a CISSP, CISM, and no idea how he ended up where is. He has been a help desk technician, network administrator, quality assurance engineer, release manager, IT manager, instructor, developer, consultant, and product development manager, and is currently an information security professional. He is proof that careers sometimes only make sense in retrospect. 15 years of information technology experience, a CISSP and CISM.